From the Anvil escutcheons, also known as keyhole covers, are used to give a neater appearance to any door, while protecting the wood and paint around the key hole, as well as preventing any draughts that may come through this opening. 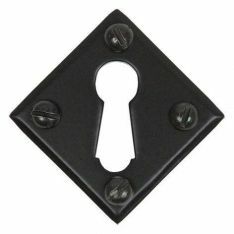 Our selection of escutcheons comes available in various finishes, including black, brass, bronze, chrome, iron and pewter, as well as in diverse styles, including euro profile escutcheons, such as the pewter round regency euro escutcheon and standard style escutcheons, such as the diamond standard escutcheon. Our range of letter tidies also prevents currents of cold air from passing through letter plates. To further equip an entrance door, we also have available a collection of unique and handcrafted door knockers, including the traditional brass lion’s head door knocker. Door numerals and letters can also be used to add your own identity to your front door. To enhance the privacy and security of entrance doors, we would recommend installing a door chain and peephole. Our snib and release locks or thumbturn locks are ideal to be used as a secondary locking method for exterior doors and as a primary locking mechanism for bathrooms, toilets and bedrooms. In case your front door isn’t equipped with a door handle, our selection of cylinder pulls and centre door knobs are the perfect substitute. Doors tend to suffer from a lot of wear and tear, mostly on the bottom part of the door. For this reason, fitting kicking plates would be a great option. Door stops are also ideal to prevent dents and scuff marks on walls from opening doors too quickly or widely.